If one of your new years resolutions is to reduce your motion control costs without making sacrifices, this might be the year you can actually scratch it off your list. For most businesses, new year’s resolutions remain pretty consistent from year to year: Optimize costs without sacrificing performance. Get to market faster. Beat the competition. These goals stay the same because they’re not easy to achieve. Doing more with less can be critical to your success, but the “how” is both difficult and changeable. Even if you make it happen one year, next year’s circumstances may present a whole new set of challenges. That’s why it’s important to invest in business decisions that deliver long-lasting benefits. In the world of industrial automation, one such decision stands apart for its proven advantages: software-based motion control, or simply soft motion. Soft motion outperforms the traditional hardware approach in a variety of ways, including flexibility, agility, scalability, and performance. But nowhere is the case for PC-based motion control more compelling than the cost comparison. Let’s quantify the difference in cost between the hardware, DSP-based solution and the software platform solution. 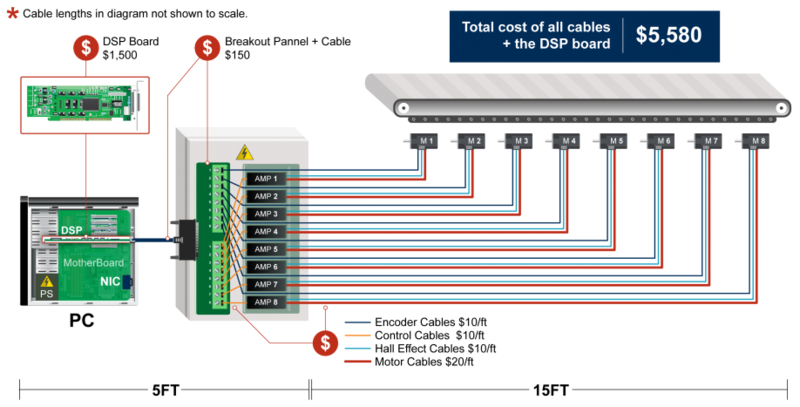 For the DSP-based solution, we need to find the average length of a cable. For the analog cable, we can assume that it is a fixed length of 5 feet from the PC to the amplifiers. For the encoders, the Hall effects, and the motor power, we can say that the shortest cable would be around 4 feet. The farthest axis is 15 feet farther away, so the average axis is 7.5 feet farther away, for a total of 11.5 feet. 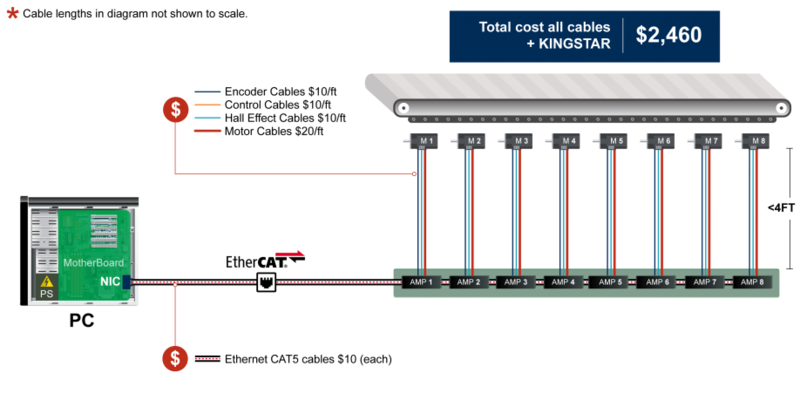 For the EtherCat software-based solution, we can assume that an EtherCat cable will cost about $10 for any cable up to 25 feet long. For the other cables, to get from the motor to the amplifier will be the shortest cable length of about 4 feet. We also have to account for the fact that EtherCat amplifiers are slightly more expensive to cover the cost of the EtherCat interface. This will come down in the future, but for right now we will assume that it costs an extra $75 per amplifier. 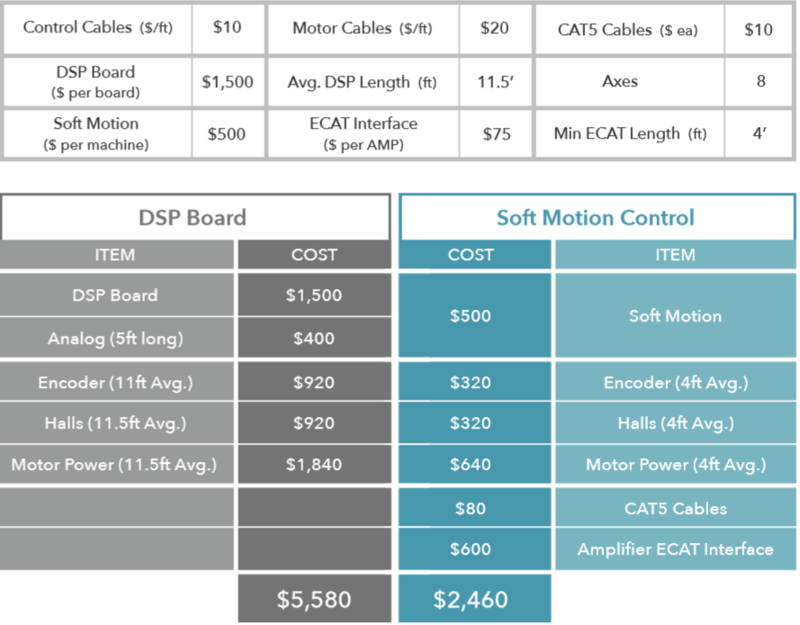 As you can see, the software-based motion control solution costs just 56% less than the hardware-based approach, with no loss in performance. If one of your new year’s resolutions is to reduce your motion control costs without making sacrifices, this might be the year you can actually scratch it off your list. For a more detailed comparison of hardware vs. soft motion control, get the white paper.